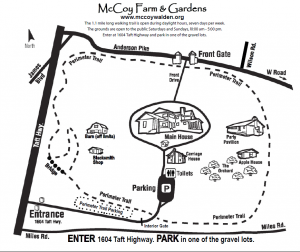 The McCoy Farm front gate (normally closed) is at 1715 Anderson Pike, Signal Mountain., TN 37377. The back (normal) entrance is at 1604 Taft Highway, Signal Mountain, TN 37377. This is the first driveway on the left at the bottom of the hill, traveling south (towards the Town of Signal Mountain), on Taft Highway. The walking and running trail is open during daylight hours, 7 days per week. For parking, please use the gravel lot outside the gate at the Taft Highway entrance. The main McCoy grounds are open to the public on Saturdays and Sundays, l0:00 am – 5:00 pm. Please enter through the Taft Highway entrance, bear left, and park in the main gravel lot on the right. Larger Group (25 persons or more)? You can have an event at McCoy.